Time was when “China” stood for little more in the West than exotic artifacts of a little-understood culture – trinkets evoking the romance of a bygone colonial era. Today, China is turning such quaint notions on their head by projecting a vibrant new pop culture that may help revolutionize global trends. 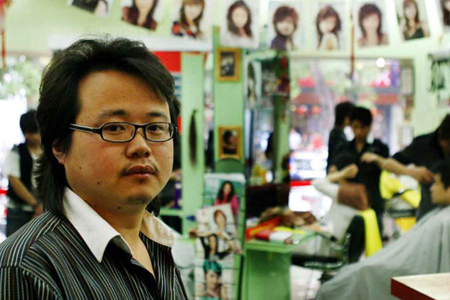 Mei-Li hair salon owner Cheng Qilai has opened five branches across Beijing since 1995.
citizens are embracing an eclectic sense of fashion and style that has, in turn, led to a boom in the beauty industry. The Foot Style Rockers, a Beijing-based break dancing crew that participate in battles and jam sessions around the city that draw the best nearby talent. China’s growing hip-hop community is still small enough that a local break crew can organize events with some of the scene's top players. China's urban scene today is a place where baggy jeans, sideways baseball caps and flashing neon lights increasingly advertise the word “hip-hop,” the popular American-born art that's taking on a Chinese identity. Fujian opera is one of many forms of Chinese opera, a classic art form with codified and ritual postures, facial expressions, and makeup. I went backstage and stepped directly into the dramatic storm: last-minute preparations for an opera in honor of the Beijing 2008 Olympics.